People are always talking to Sydney Bruno about dogs. Mostly one dog in particular - the 17- year-old freshman has a constant companion, her service dog named Toby. Toby's job is to save Sydney's life. He is trained to alert her and others nearby if her blood sugar goes too high or too low. Sydney was diagnosed with Type 1 diabetes in May 2008 when she was 15 years old, which means her body cannot produce insulin, a chemical necessary in regulating blood sugar. "I lost 20 pounds in two weeks," she said. Sydney is excellent at managing her own blood sugar for someone her age, said Melissa Bruno, her mother. "She counts all the carbs' gets up in the middle of the night to adjust'" she said. "Sydney's always weighing - counting everything." But the condition is more serious than most people realize and even the slightest human error can have serious consequences. "It can cause blindness, heart attacks and other awful conditions eventually. No matter how hard you work, (an episode) can sneak up on you,,"Melissa Bruno said. The family was prompted to look for other options after a terrifying overnight field trip last fall. Sydney woke up feeling fine in the morning and headed to the bathroom for a drink of water. Without warning, she lost vision and hearing and nearly passed out before a fellow student went for help. "My sugar was low. If someone weren't there, I don't know what would have happened," Sydney said. With college on the horizon, the Bruno family decided there had to be a way for Sydney to enjoy the security of a constant "someone" who could always be there. After some online research, Melissa Bruno discovered the relatively new advent of service dogs trained to detect changes in blood sugar. "I thought, "dogs could do anything." They have dogs to help with epilepsy, so why not diabetes, too?" she said. Because dogs can smell the chemical acetone, which is naturally released when blood sugar shifts, they can be trained to bark or paw their companions when they sense fluctuations. "Dogs are more sensitive than the technology," said Melissa Bruno. "They can alert you 45 minutes before a machine would." The family contacted Julie Noyes, a certified dog trainer in Colorado whose primary line of work was providing cadaver-finding dogs used by the Federal Emergency Management Administration during disaster relief operations, she said. 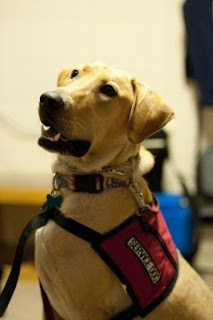 Service dogs in Toby's line of work are selected and begin training as "early as possible" when they are puppies, usually "within six to eight weeks," said Noyes. Their personalities must be just the right combination of obedience and persistence to facilitate training while allowing the dogs to insist in an emergency, Melissa Bruno said. Soon, Sydney was self-inducing blood sugar highs and lows while wearing clothes washed with scentless detergent, mailed on dry ice from Michigan to Colorado. By February of this year, the Bruno family welcomed the 6-month-old American Labrador into their home. He was on the job from day one, said Melissa Bruno. "He barked to alert her at our first meal together." Now Sydney travels with Toby everywhere - from classrooms, to Saga, to her dorm room where he lives with her in McIntyre Hall. Anywhere she goes, the law requires Toby be granted access. "He's been with me to the movies," she said, smiling. In high school, Sydney said, Toby was more popular than she was. Toby can be challenging, however. "It can be difficult, making sure he gets to meals on time," she said. Toby's life can be difficult as well, said Melissa Bruno. The family cannot treat him like a pet and must ignore him whenever possible. "Service dogs have to be able to live in public," said Noyes. But the family is happy with the reception they have received at Hillsdale. "All my professors are very nice about him," Sydney said. After rearranging her class schedule, "my old professor told me she would miss Toby," she said. Melissa Bruno emphasized how glad she is that Sydney has Toby for a safe guard. "I can sleep much better. He is a hero."